Phantom regiment enjoying "strongest start in five years"
Fresh after a victory in Harrison, Ohio, on Wednesday, the Phantom Regiment's director Pat Seidling said that the corps is enjoying its "strongest start in five years." "(Harrison) was our best performance to date, so the kids are definitely feeling good about that show," Seidling said, adding, "A good show with a good score -- it's good news." 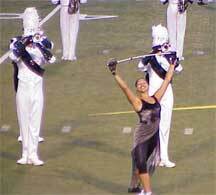 Phantom Regiment color guard soloist Angela Morris, a third-year member, performs in Toledo last weekend. Photo courtesy of Lee Julian. Seidling said the corps' guard and percussion sections have been particularly outstanding this far. "The color guard is really holding its own. The color guard's success is somewhat unexpected -- it's one of the best (color guards) out there," Seidling said. Regiment conductor David Simon, 20, of Austin, Texas, foreshadowed Seidling's sentiments after the Toledo show last weekend. "The guard is much better this year, the drum line is really getting stronger, and so we have just a lot of things going for us," Simon said. (Read an interview with David Simon) At this point in the season, Seidling said the corps, like most others, is seeking input from judges. "We're interested in how we look and feel, and how the judges are perceiving us," Seidling said. "We're really trying to get the best input from judges to go the distance." The Phantom Regiment is progressing "very well" so far, Seidling said. "We're ahead of ourselves. The kids are picking up really fast, and the staff is working together really well. (It's) a great group effort," Seidling said, noting that the return of many Phantom veterans have set the rehearsal demands at a high level. Simon is also pleased with the corps' progress. "I think we are pleased with the results so far, and we have something that is very effective. The music is exciting, our drill is exciting, and the show is coming together really fast. We are really excited about it and we are just ready to take it all up to the end!" Simon said. Seidling said the entire corps performs well throughout its 2003 program. "The corps is strong in every section (of the show) this year," Seidling said, noting that audiences will be surprised at the program's finale, which Simon also cited as a showstopper. "My favorite part of the show is the third number that we play -- there is a loud section where the drum line is going through the corps that is playing really loud and there are these big massive low brass notes. I just love to hear the low brass honking those notes out with a good sound. I think we all love it! By the end of the season we are just going to be the "Phantom Regiment Pipe Organ," and I think people are going to end up crying!" Simon said. Conductor Simon said that the Regiment's 2003 program, entitled, "Harmonic Journey," is a show that differs from Regiment shows of the past. "The program this year is a little different than Phantom Regiment's past years. I think we are going more in the direction of adding some more effects and making sure that the audience really understands more easily what we are doing," Simon said. Francois Morin and Dave Wilson collaborated on the interviews for this story.